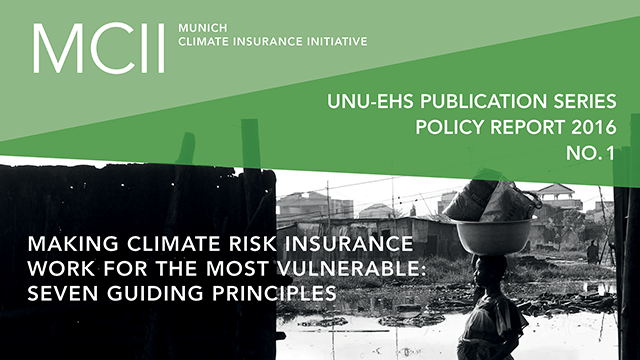 In conversation with Eleanor Water and Laura Schaefer, two of the authors of the latest policy report “Making climate risk insurance work for the most vulnerable: Seven guiding principles” from the Munich Climate Insurance Initiative. The report was launched at the UNFCCC Conference of the Parties (COP 22) in Marrakesh, Morroco. What is climate risk insurance? Ms. Schaefer: Climate risk insurance (CRI) is a tool that can act as security against loss of assets, livelihoods and lives due to climate related risks. A well-designed climate risk insurance can protect people against climate shocks by acting as a safety net and buffer after an extreme weather event. Ms. Waters: For example if a farmer has climate risk insurance and loses all his crops during a drought, he can use the payout to recover instead of resorting to other coping measures such as selling her land or cattle or taking her kids out of school. A farmer enrolled in the R4 Rural Resilience initiative, which is a rural resilience programme in Africa that offers climate risk insurance as one of their products, said “Insurance is like an aunt, when your mother is not around.” Climate risk insurance does not cover all the losses a farmer may face when the rains fail but it can limit his financial losses. What are the types of climate risk insurance? Ms. Waters: The two main types of climate risk insurance products that we look at are indemnity-based insurance and index-related insurance. Indemnity-based compensation refers to payouts that cover the actual losses after an extreme event occurs. When a farmer suffers a loss, he or she reports the loss and depending on that report, gets a payout. Index insurance on the other hand pays out depending on the weather event. For example, if a village gets an average of 100-200mm rain in a year and then – due to a drought in a particular season rainfall is below 100 – the insurance would be paid out. Ms. Schaefer: When talking about climate risk insurance, it is also important to differentiate between insurance solutions for individuals (we call this direct insurance), and insurance for countries or institutions – and we call this indirect insurance as individuals benefit indirectly from payments which are intermediated by the insured government or from being member of an institution that has insurance. How can insurance be beneficial for the poor and vulnerable? First, it can protect people against climate shocks by acting as a buffer after an extreme weather event. Second, it can empower people by unlocking opportunities that they might otherwise not have – such as the ability to save or invest in high-return activities. For example, climate risk insurance can be bundled with savings programs that help improve people’s savings and access to credit. Third, we also found that insurance can have a transformative effect on behaviour. It can motivate people and countries to think-ahead and plan better before disasters hit. The African Risk Capacity, a special agency of the African Union that helps countries prepare and respond to extreme weather events, requests contingency planning as an eligibility criteria for countries to purchase insurance. We found in our research that this has changed the process of disaster relief programmes in relevant countries because it provides incentives for governments to invest in their emergency planning and response capacities before a disaster happens. What do you mean when you say pro-poor principles of climate risk insurance? Ms. Waters: We have learned that insurance can be beneficial but we need to know HOW and under which circumstances. When we started this research we wanted to find out how insurance can actually benefit poor people. We looked at 18 existing climate risk insurance schemes and analyzed how they targeted and reached the poor and vulnerable. Based on our research, we identified successes and challenges that existing schemes experienced when trying to reach the poor with this type of insurance. These lessons serve the basis for our so-called Pro-Poor Principles. We believe these principles can guide new insurance schemes that want to benefit the poor and vulnerable. They can also help with identifying insurance schemes to be supported by international initiatives, such as the G7 InsuResilience Initiative. How did you research these principles? Ms. Waters: We analyzed 18 existing climate risk insurance schemes – many of which had a focus on targeting the poorest segments of the population – and looked into success factors and challenges. For example: A success factor for one scheme in Haiti was working with an existing organization that had ties to the community. This organization worked exclusively with women – which led to them having a good understanding of the women’s and the community’s needs. Ms. Schaefer: The research process also involved expert interviews. In particular experts from the field of insurance, climate risk management and adaptation. Essentially, we ended up with a series of ‘lessons learned’ and from these, we derived the pro-poor principles. What is your biggest takeaway from researching climate risk insurance? Ms. Schaefer: One of the biggest takeaways from our research is that insurance is not a stand-alone tool. It can only be beneficial for the poor and vulnerable if used in combination with a broader risk management strategy. This strategy needs to be focused on preventing losses – for example through adaptation measures or early warning systems. Ms. Waters: Insurance is not a universal remedy – and not always the appropriate tool. It’s very important to understand the needs of the population and the local context to know whether they would benefit from insurance or not.